What a lovely word! That photo immediately made me think of one of my favorite travel-related words: peregrination. Also less known than many (it's a little bit more common in Spanish, peregrenacion, which is how I first came across it). It's a long journey, particularly on foot. Possibly less celerity involved, but delightful nonetheless. D'ya know - while I was writing this, I was thinking: "I must look up why Peregrine Falcons are called Peregrine Falcons." And then I forgot. And then you reminded me. So thank you! 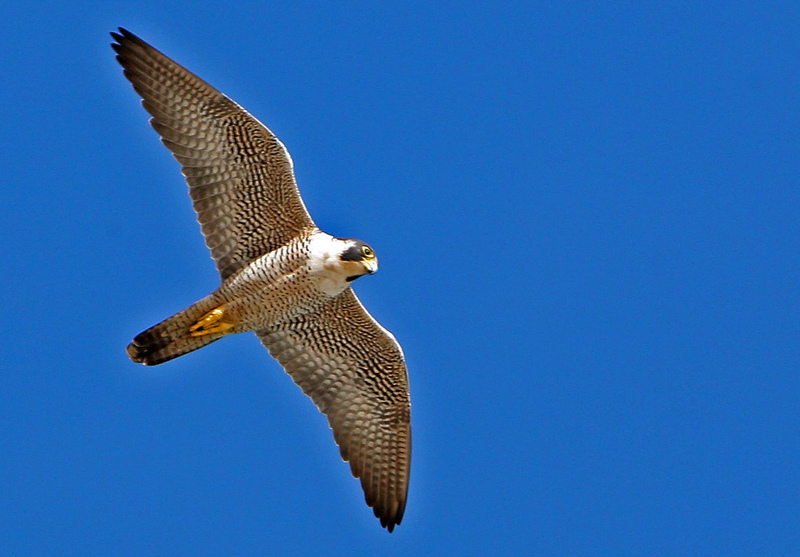 According to the OED, it's from Latin and was originally literally "pilgrim falcon", so called because it was caught by falconers when fully grown on its migration, rather than being taken from the next. Which is jolly interesting. Thank you Katie. My twitter is faster than blogger... CeleBrity was yesterday's (I was still replying to the previous and being Twit...) today is Celerity. Definetly something nicer... ;). More natural, too. Curiously I believe people tend to remove grace and effortlessness from the noun when using it... it was nice to learn with you that they go together and not just for lirical purposes. Well, that's what *I* think, Teresa. The dictionaries don't mention anything about grace in its definition; it just sounds a particularly graceful word to me. Peregrines are indeed beautiful birds, Eddie. I'm sure you know they only go that fast when they're headed downwards. I feel there must be a moral there, somewhere, but I don't know what it is. Of course, Sally - whenever my wife complains that I've taken her to yet another dive, I muse: "Ah, yes! But consider the peregrine falcon ..."
"Whenever my wife complains that I've taken her to yet another dive, I muse: "Ah, yes! But consider the peregrine falcon ..."
I am lifting that phrase straight off the page and plan to use it in my own everyday... Actually laughing aloud at this! I feel I have found my webpage home! A blog full of intelligent wit and lots and lots of beautiful sounding words!! Thank you Michael - I've changed the credit on the photo itself.